Although it takes a couple of days to really notice the difference, once that was done we became nearly addicted to using this spray. A daily light mist was all it took to keep the stalls fresh, as well as any equipment we wanted to deodorize. It has a fresh, natural scent that is not strong enough to be a cover-up, it simply keeps working. We could deodorize virtually anything. We sprayed the stall bedding, walls, barn aisle, wheelbarrow and pitchforks. Our Best Buy is Bye Bye Odor. It’s inexpensive and easy to use in a garden sprayer. A mixture of 2.5 gallons lasted us about a month on one stall, making the cost pennies per day. Also available in a ready-to-use trigger-spray bottle, but that’s more suited for smaller items like pet stains or boots. View the complete article comparing all products here. Eliminate Odors With Bye Bye Odor Don’t Just Cover Them Up! Horse owners love “barn smells.” Sweaty leather, fresh pine shavings, liniment, hay, tack, and that sweet horse smell! It is all part of barn life. Sadly, most people just accept ammonia smell from urine in their stalls as just part of the deal. Eliminate that ammonia smell and you will come to appreciate all those “good” smells more, and no longer willing to tolerate the bad ones. This is where Bye Bye Odor® comes in! Bye Bye Odor is a natural non-toxic microbial solution especially formulated to substantially reduce or eliminate the ammonia levels from animal urine as well as manure odors. Bye Bye Odor is different than other products on the market because it actually consumes the organics causing the smell and the ammonia. Other leading brands simply soak up urine for removal or try to capture the ammonia vapors. The microbes used in Bye Bye Odor are effective against manure, urine, perspiration and many other funky smells INCLUDING skunk. The danger of ammonia is under appreciated by most horse owners. It’s just that “stall smell” we’ve gotten use to. The inflammation caused by even low levels of ammonia from the breakdown of urine can impact a horse’s health, performance, and even cause severe respiratory problems. We aren’t in the stall or trailer for many hours every day and our noses are 5-6 feet above the surface. Ammonia is heavier than air so it’s near ground level, closer to where your horse’s nostrils are. 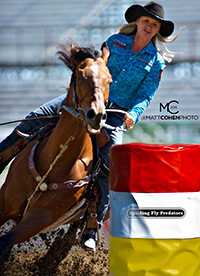 Professional barrel racer and roper team, Sherrylynn and Mike Johnson, know how important performance is. A few years ago Sherrylynn was riding a horse named J.T. that had respiratory issues caused by extended periods of trailer time traveling the pro rodeo circuit. This affected his performance and they missed the 2009 WNFR. Then Sherrylynn started using Bye Bye Odor in the trailer, J.T.’s symptoms disappeared, and he was seconds faster. One year later they qualified for the 2010 Wrangler National Finals Rodeo, her 4th time to run this event. Sherrylynn's husband Mike Johnson is a 24 time WNFR competitor. Follow them at www.johnsonsportline.com. Clean stalls as you normally do then spray a mist of Bye Bye Odor every day on the wet spots. It’s quick and simple. 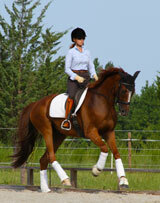 Around horses the most popular Bye Bye Odor is the concentrate that is diluted with water before use. Simply pour 4 oz into a clean 2-3 gallon garden-type pump up sprayer and add tap water. 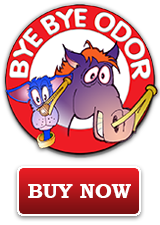 One 4 oz bottle of Bye Bye Odor Concentrate costing $19.95 will treat 5 horse stalls or a 30 dog kennel for an entire month. It will also refill a 32 oz. spray bottle eight times. For larger facilities a 32 oz. bottle is available for $119.95 that makes 20 gallons and will treat a 40 horse barn for one month. Great For: Stalls, Trailers, Pens, Saddle Pads, Horse Blankets, Boots, Kennels, Dog Beds, Cages, Sweaty Laundry, Cat Litter Boxes, and More! Our customers are finding uses that we never imagined. Many with live in horse trailers use it in the black water tank of their living quarters trailer as well as the back where the horses are. Others have used it for sweaty gym clothes and shoes, musty closets, around toilets, truck floor mats, carpets, furniture, kitty litter boxes and more. Here is what one customer had to say about it. “I decided to try that Bye Bye Odor on a dog bed. The dog had rolled in quail manure fertilizer (yuk) and I have been trying for over a month to get the smell out. I have washed it numerous times, and even washed it in pine sol. Yesterday, I sprayed that on it and it smells like a fresh new bed. That stuff is pretty amazing. I am definitely keeping that on hand." Marte W.
Here is an Amazon.com customer comment on Bye Bye Odor. "This REALLY works. I have horses and once we started using this in the barn there was a HUGE difference in the freshness of the air. The ammonia from soiled bedding and matts is horrible for humans and animals. Bye Bye Odor gets rid of the smell and leaves a nice fresh scent, not perfumey or flowery, just fresh. I have used it in the house if one of the dogs has an accident too. I spray the whole barn down with it after mucking,...tools, buckets, floors...everything! Once you start using it, you won't tolerate "barn odor" anymore. It's safe for composting too, actually helps the process. I suggest getting the 32oz Ready to use the first time to try it out. But I now use the 32oz concentrate, mix it in a gallon hand sprayer, and it lasts about a month and a half for our 12 stall barn." Smart Tip: Bye Bye Odor Helps Stop Flies!